For me, the main event at NAEA will be Oliver Herring's TASK Party taking place on Saturday, March 3. You might already know about TASK; parties have been held at museums, high schools, colleges and at other venues in the US and abroad. But if you're not in the know...what is a TASK Party? On the base level, it's just what it sounds like: a group of people come together at a designated place and time to brainstorm and complete various tasks together. Tasks come from a communal box or pool, and once a participant completes a task they write down a new one for the pool. It's a collaborative, improvisational art event designed to get participants creating and interacting in different ways. Herring sets the proverbial (or perhaps, literal!) ball in motion at a TASK party, but after that a Frankenstein-ian element can take over as participants have creative control...not the artist. Some sample tasks: "Ask someone if you can paint him or her on a wall." "Make a chicken hat." " Create an extra limb. Then find a doctor to amputate it." For one person, participating in a TASK party might just be a fun way to spend a Saturday afternoon. For others TASK might totally change your perspective. You might find yourself looking for potential in the mundane - whether that's objects or interactions. Perhaps you'll bond with a stranger over your chicken hat. You might create something beautiful...or perhaps the interactions you have with others is the beautiful part, and the best end result. Jean Shin, Chance City, 2009. From Jean Shin: Common Threads at the Smithsonian American Art Museum, May 2009. Jean Shin's artwork is all about the potential in the mundane, but in a different way. And while TASK might make you consider your interactions with other people, Shin will make you think about your relationship to stuff--discarded stuff. Shin creates installation pieces from discarded items, resulting in large sculptures that inspire the viewer both aesthetically and conceptually. What does what we throw away say about us, individually and as a culture? By reassembling great amounts of discarded objects, like pill bottles or lottery tickets, Shin makes them new again, while raising new questions about their significance. I love sculpture that raises these (at this risk of sounding pretentious) Duchampian ideas about the aesthetics and significance of found objects. 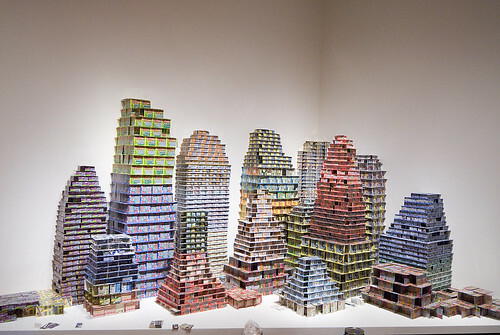 One such work is Chance City - a model-sized city built completely from discarded losing lottery tickets. The visual richness of the work, the materials, and the construction can all lead to different interpretations that might make the viewer thing. Is the work a comment on the fragility of the housing market in the US? Or is it about the viability of the American Dream? Is it about luck? Another work, Chemical Balance, turns collections of those familiar orange prescription pill bottles into stalagmite and stalagtite-esque chandeliers that are illuminated from the inside. Again, there are any number of ways to interpret this work. When I look at the work, I see a rumination on the modern dependence on prescription drugs, for better or for worse. Someone else might see it as a comment on chemical versus natural forces. Yet another might see a new chandelier for the dining room! And that's the beaty of it. To learn more about TASK and Oliver Herring check out TASKparty.org and Art 21's Oliver Herring artist page. Craig Roland also has a nice description of TASK and a list of example TASKs at his blog. For more information on where and when to find these two artists at NAEA go to this schedule. You can bet I will be there- if you see me, say hello! P.S. My apologies for the lack of posts in the last month. Aside from a variety (yes, a variety!) of illnesses, my grandfather, Gil Davis. He was a great man, a World War II vet, an ardent fan of Boston sports teams, and a terrific grandfather. And most importantly for this blog, he inherited Davis Publications from his father and grandfather, and worked there for nearly 60 yaers. It's safe to say if it wasn't for him, I wouldn't be here blogging today. This post is for him.